More And More Earthquakes – Jesus Warned Us – The Time Of Sorrows – Coercion Code – "Dark Times are upon us"
Jesus told his disciples that there would be wars and rumors of wars, earthquakes, pestilence’s, plagues, famines, and these would be the beginning of sorrows. In the Greek language this, “beginning of sorrows” is referred to as “birth pangs”. We have recently experienced a period that has had one of the highest rates of great earthquakes ever recorded,” said lead study author Tom Parsons, a research geophysicist with the U.S. Geological Survey (USGS) in Menlo Park, California. The average rate of big earthquakes — those larger than magnitude 7 — have been 10 per year since 1979, the study reports. That rate rose to 12.5 per year starting in 1992, and then jumped to 16.7 per year starting in 2010 — a 65 percent increase compared to the rate since 1979. This increase accelerated in the first three months of 2014 to more than double the average since 1979, the researchers report. the years 2010 to 2014 are so far averaging 161. – March 11, 2011: A magnitude-9.0 earthquake off northeastern Japan causes a tsunami that sweeps onto the coast. About 19,000 people are killed and three nuclear reactors melt at the Fukushima Dai-ichi power plant. – Jan. 12, 2010: A 7.0 earthquake devastates Haiti’s capital and surrounding cities, killing 314,000 people. – May 12, 2008: A 7.9 temblor in China’s Sichuan province kills 87,000 people. A disproportionate number of them were children killed when their shoddily built schools collapsed. – Oct. 8, 2005: A 7.6 earthquake kills about 80,000 people in northwestern Pakistan and Kashmir. – Dec. 26, 2004: A 9.1 earthquake off western Indonesia triggers a tsunami in the Indian Ocean, killing 230,000 people in a dozen countries. – Dec. 26, 2003: A 6.6 earthquake flattens the historic city of Bam in southeastern Iran, and some 26,000 people are killed. And volcanic activity has been rising all over the planet as well. In 2013, the number of eruptions around the globe set a new all-time high. 2013 will go down on record, as seeing the most volcanic eruptions recorded in modern history. The previous number was set in 2010, at 82 volcanic eruptions for the year. The number of volcanoes erupting across the planet has been steadily rising from a meager number of just 55 recorded in 1990. All over the world seismic activity is on the rise. The prophet Isaiah envisioned monster quakes in the last days, saying, “The foundations of the earth are shaken. The earth is … shaken exceedingly. The earth shall reel to and fro like a drunkard, and shall totter like a hut … in the day of the great slaughter, when the towers fall” (Isaiah 24:18-20; 30:25). Cascadia subduction zone that stretches from northern Vancouver Island to northern California can also produce a devastating Earthquake, that could kill thousands of people, like Japans 9.0 earthquake & trigger a large tsunami that would hit the USA west coast, Hawaii, & Islands of the Pacific. According to Geologists the Cascadia fault in the Pacific Northwest is locked up putting an enormous amount of pressure on fault, meaning that a massive megathrust earthquake could occur at any time, seismologists are warning. Earthquakes that occur in the New Madrid Seismic Zone potentially threaten parts of seven American states can would kill thousands of people. Illinois, Indiana, Missouri, Arkansas, Kentucky, Tennessee and Mississippi. The massive New Madrid earthquakes of 1811 and 1812 were strong enough to make the Mississippi River run backward. There’s a remote risk that the Kilauea volcano, one of the most active in the world, will slump into the ocean, triggering a gigantic tsunami, a wave up to 990 feet high, which could devastate coastlines around the Pacific from California to Australia. The western flank of the Cumbre Vieja volcano on the Canary Island of La Palma could collapse, sending walls of water 100 meters high racing across the Atlantic. California according to Geologists is well over do for a major earthquake! But a group of scientists in Northern California, looking at the geologic evidence from the last 400 years came to an alternative prediction: the Bay Area is somewhat more likely to get a series of serious quakes rather than one huge one. If that sounds like good news, it isn’t. The San Francisco trembler of 1906 was a giant earthquake, said David Schwartz, a geologist at the U.S. Geological Survey in Menlo Park, California. “If that would happen today, with all the additional urbanization that has occurred throughout the Bay Area and Northern California, the effect would be far worse than it would be in 1906,” he said. The 1906 earthquake, which struck at 5:12 a.m. on April 18, is thought to have had a magnitude of 7.9. Three thousand people died in the quake and fire that followed. San Francisco was virtually destroyed. But, the city was small then, and most of the Bay Area was farms and orchards. 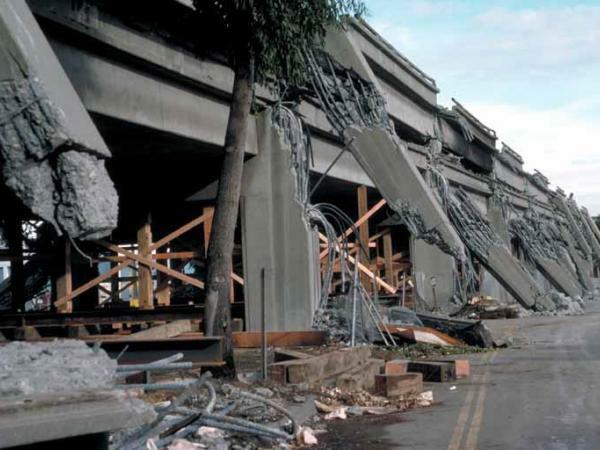 The most recent major earthquake in the area, the Loma Prieta in 1989, registered a magnitude of 6.9. The difference is actually huge. Each time the scale goes up a full magnitude — from 6.9 to 7.9, for example — it represents a 32-fold increase in energy release, so Loma Prieta, despite causing $6 billion in damage and killing 63 people was minor league in comparison. Schwartz is lead author of a paper to be published in the Bulletin of the Seismological Society of America. One good effect of 1906 was that it released a great deal of seismic pressure, and the subsequent century has been relatively calm. Loma Prieta occurred in a fault no one knew existed, outside the major fault system. Geologists speak of earthquake in terms of cycles. Pressure in tectonic plates builds until the strain snaps and there is a major earthquake. Things calm down while the pressure rebuilds, continuing the cycle. Coastal California is where two huge plates hugging the surface of the planet — the North American and the Pacific — collide. All the faults in the Bay Area, including the San Andreas, are slipping at high rates and accommodating the movement. “The stress on the crust is pretty much steady-state,” Schwartz said, “about 40 millimeter [1.5 inches] a year. That stress gets released by slip-on faults primarily in moderate and large earthquakes.” There is considerable variability in the intensity of those quakes. The written record of earthquakes in the area only goes back as far as 1776, when monks at the Mission Dolores and soldiers at the Presidio began keeping records. There is no evidence of a full cycle in the records. But, the researchers from USGS, the California Geological Survey, two consulting firms and the University of Missouri-Kansas City, went back further. They dug trenches across faults, documenting surface ruptures, using radiocarbon dating and collecting pollen. Their record goes back to 1600. They found several large quakes between 1690 and 1776 on five of the faults, including the San Andreas, Hayward, Calaveras, Rodgers Creek and San Gregorio. The researchers think the stress released in those quakes was about equal to what happened in San Francisco in 1906. That, to them, is a full cycle. They concluded that there are two historic ways stress on Bay Area faults can be released: in one giant upheaval as in 1906, or through a century of lesser quakes, as happened in the 18th century. Because the stress is spread out, they think it is somewhat likelier to have a series of quakes than the Big One. They concluded that there is a 63 percent chance of a 6.7 earthquake or higher in the next 30 years. “This study represents a heroic amount of work,” said Greg Beroza, a professor of Earth sciences at Stanford University in California. “The data is limited — dates are uncertain as are magnitudes — but despite these limitations, they have shown that the Bay Area was very seismically active during this period,” he said. Choosing between predictions of the Big One and many smaller ones is open to interpretation. “Pick your poison,” said Beroza. Are you ready for these for these signs of the times that Jesus & other prophets spoke about? If not, you can get ready now by repenting (turn away) of your sins, and placing your full trust and faith in the Lord Jesus, and begin studying His Word.